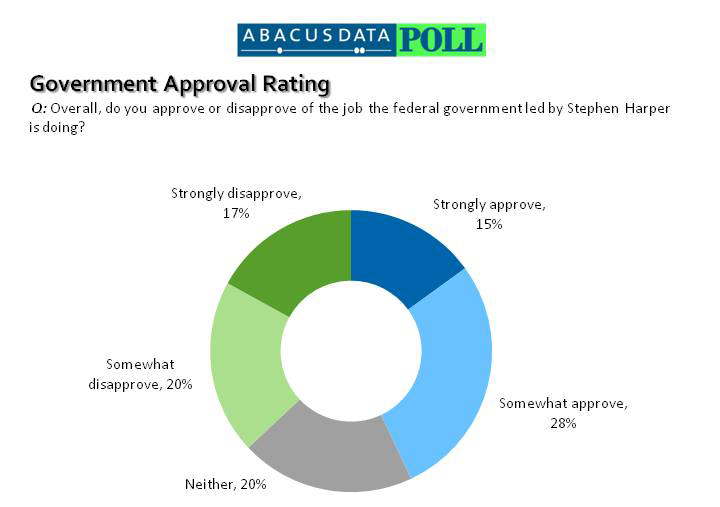 According to a new national survey from Ottawa-based Abacus Data, a plurality of Canadians (49%) believe the country is headed in the right direction and are more likely to approve (43%) of the job the Federal Government led by Prime Minister Stephen Harper is doing than disapprove (37%). 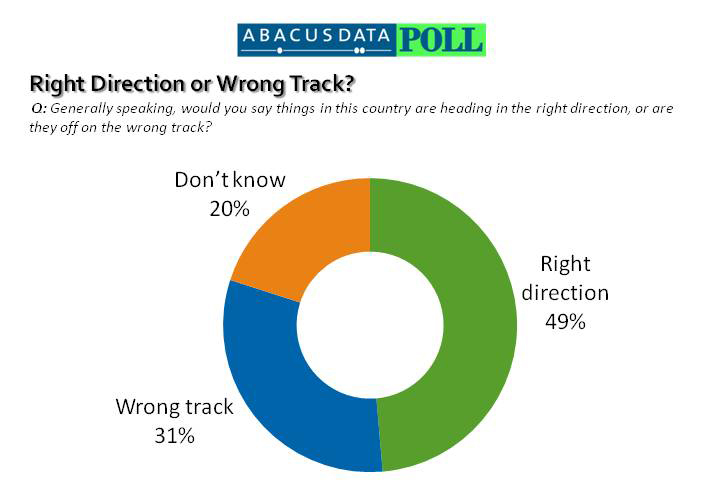 Nationally, almost one in two Canadians surveyed (49%) said that generally speaking the Canada was headed in the right direction while three in ten (31%) believed it was headed on the wrong track. Twenty percent were unsure. The level of optimism among Canadians stands in stark contrast to our neighbours south of the border where a recent Ipsos/Reuters poll found that only 21% of Americans believed the U.S. was headed in the right direction compared with 73% who thought it was on the wrong track (Ipsos/Reuters, August 4-11). Regionally, residents of Alberta, Manitoba, Saskatchewan, and British Columbia were most likely to believe Canada was headed in the right direction while Quebec was the only region where residents were more likely to believe Canada was headed on the wrong track than in the right direction (Quebec – right direction 35%, wrong track 41%). Not surprisingly, opinion was strongly related to political support with 88% of Conservative Party supporters believing Canada was headed in the right direction compared to 32% of Liberal supporters and 27% of NDP supporters. Respondents were asked to rate the federal government in nine policy areas. Although ratings were relatively consistent across the policy areas, the government received higher and lower ratings in a number of them.Canadians were most likely to approve of the federal government’s handling of economy with 46% saying they approve while only 17% saying they disapprove. Along with the economy at least four in ten Canadians approved of the job the federal government was doing with national defence (42%) and international trade (42%). The government received its lowest rating on immigration with only 27% of Canadians approving of the government’s job performance. All other areas including foreign affairs, crime reduction, job creation, taxation, and deficit reduction had about equal numbers of Canadians approving and disapproving. “In these uncertain global economic times, it is striking and significant that the Conservative government is rated highest in its handling of the economy,” said Coletto. “The government has staked its reputation on its ability to manage the Canadian economy and thus far, a large segment of the population agrees that it is doing a fine job at it.